We rely on our appliances to refrigerate our food, wash our clothes, and to keep us cool. Unfortunately, they don’t always work as they should. Sometimes, our air conditioners stop providing enough cool air, make strange noises when running or even refuse to start altogether. You may need to call a professional, but here are a few things you should consider. In some instances, you may be able to repair simple AC problems on your own. Most homeowners can clean the condensate drain, clean or replace air filters and clear debris from the fan, compressor or condenser without professional help. On the other hand, there may be times when you can successfully find the root of the problem but should not attempt to deal with it on your own. Jobs that only someone with HVAC training should do include checking and adjusting refrigerant levels, cleaning evaporator coils, adjusting electric connections and lubricating moving parts. Size: Your AC unit needs to be just the right size for your home if you want an efficient cooling system that is not overly expensive to run. Ask an HVAC technician for a professional load analysis of your home to make sure the unit you buy is neither too small nor too large. Ductwork: Duct leaks are not uncommon but can make even the most energy-efficient AC system extremely inefficient. Make sure your new AC unit is the right size for the space and that the existing ductwork is leak-free. 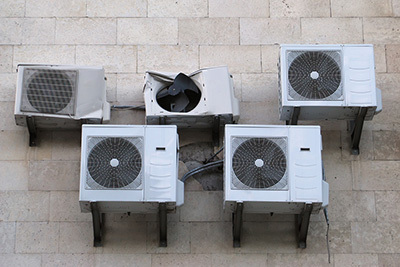 Refrigerant: Make sure your new AC unit uses an eco-friendly refrigerant. Professional system commissioning is also in order to ensure the unit is not over or undercharged. Naturally, it is easier to keep your AC unit working properly than it is to have to deal with serious problems. Proper installation, service procedures and regular maintenance can save you money and hassle. Even so, there will be times when you will need to repair the AC unit, replace parts or even buy an entirely new system. If you have HVAC problems you cannot solve on your own, it is time to call a trained HVAC technician. Having your system professionally repaired or replaced as needed will help you save energy and allow you to maintain a comfortable temperature in your home.